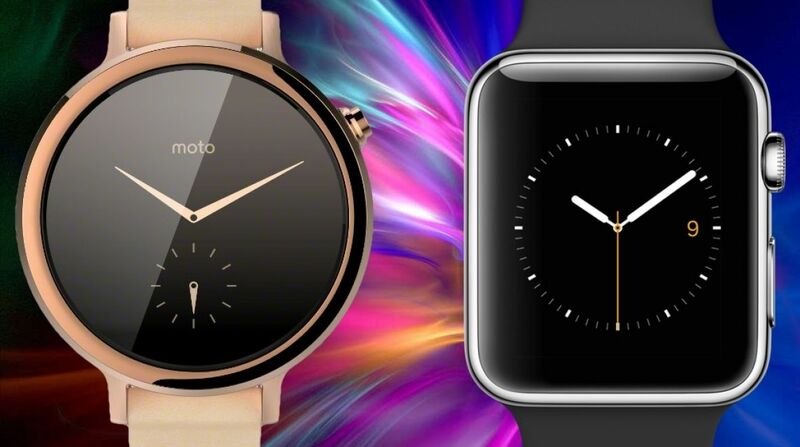 Which of these two iconic smartwatches is right for you? When it comes to giants of the smartwatch world going head-to-head this Christmas, the Moto 360 v Apple Watch is going to be one of the biggest battles. The Moto 360 will always have our respect for ushering in the era of the round-faced smartwatch, even if the original didn't quite live up to the hype. The 2015 version – now available to buy – ups the style stakes significantly, and is more than a match for the current incumbent, the Apple Watch. But which should you fork out for this Christmas? Let us help you with an easy guide to what's what. In terms of design the Moto 360 is a looker – and set to impress those whose style errs towards classic analogue watches. It comes in three versions: two 42mm models aimed at men and women, with different lugs, and a 46mm version too, which will likely just appeal to men. The smaller version has a 20mm strap for the guys and a 16mm one for the dolls while the larger watch boasts a circumnavigating 22mm version. Whichever one you pluck for, you'll find the case is 11.4mm thick; chunky but not unseemly. The crown has moved upwards, the bezels have shrunk and the watch has stylish lugs added to the body. Unfortunately, the flat tire at the bottom of the screen remains for reasons that are too boring to articulate. Read our full hands-on Moto 360 second gen review for more details. The Apple Watch, with its oh-so-square design, comes in two sizes - 38mm or 42mm - again, with pretty much ladies and gents in mind. The Sport version is made of aluminium, the standard Apple Watch of stainless steel and the Apple Watch Edition of 18K gold either rose or otherwise. The Apple Watch actually comes in 50 different variations, when you consider straps, sizes and finishes, so there's something for everybody…well, everybody that has between $349 and $15,000 to drop on a smartwatch. And if that sounds like plenty of options, then you'll be equally bamboozled by the choices on the Moto Maker online watch designer for the Moto 360. Go and have a play with it now and you'll find three different case sizes, three case colours, six choices of bezel, and five straps to play with. And that makes for a lot of possibilities. Which is the better looking is a matter of taste – and we've been burned once too often on the comments section for daring to imply which looks the best. Make up your own mind. Smartwatch specs aren't as important as other areas of technology, but screen tech does count – so do allow us to indulge in some numbers. The Apple Watch's screen is a triumph and it's only held back by some of the grubbier parts of watchOS's design. The 42mm clocks in at 390 x 312 pixels on the OLED display, and at 340 x 272 for the 38mm. That's, unofficially, an impressive 326ppi. The Moto 360's 42mm and 46mm models equate to a 1.37- or 1.56-inch LCD display. The 46mm watch has a 360 x 360 (233ppi) resolution, and the smaller version rocks a 360 x 325 (263ppi) LCD. The numbers look extreme in comparison, but that's not to say that the Moto 360 is a grainy pixel-fest. The Apple Watch looks pin sharp, but the Moto is still decent – even if the lack of OLED makes it a little duller and without that same colour punch. It's a definite win for Apple in quality here but it's very arguable that, at the these screen size, pixel density doesn't matter too much. Where you should focus your concerns is the battery size: the Apple Watch's uses a 205mAh on the 38mm models and a slightly larger 246mAh on the 42mm. If you're not down with battery tech, that's fairly tiny – which is why the Apple Watch only lasts a day away from the mains. The battery in the bigger Moto 360 dwarves the Apple Watch with a 400mAh cell on the bigger watch and 300mAh on the smaller one. The upshots are 2 days or 1.5 days on a single charge respectively. The Apple Watch and Moto 360 represent two fronts in a new Cold War of smartwatches, with Android Wear on one side and watchOS on the other. The Apple Watch offers the greater selection of apps and watchOS 2 has opened up the door to native applications for the first time. It also has the developer support only Apple can muster, which means anyone joining the ecosystem can feel comfortable about continued support. The Apple Watch is probably the sportier design with its built-in heart rate monitor and silicon straps on the cheapest version (unless you plump for the Moto 360 Sport, of course, which is so different from the main Moto 360 it's an incomparable device). However, the Apple Watch doesn't have GPS, which is a major let down but, again, only the Moto 360 Sport can fulfil this requirement, so there's no advantage for the purposes of this comparison. All the same, both systems have plenty to enjoy in terms of health and fitness opportunities but, again, there's little to separate them. The Apple Health and Google Fit platforms are depicted in user-friendly style with plenty of glanceable views of just how far through your steps and activity regime you are along with your pulse over time as needed. It all depends on your choice of watch face as to how much you see at any one moment. Possibly the only differential of note in terms of features is Google Now. It's one of the most powerful services on your wrist at present which all too often knows what you want and where you're going before you do. In a totally non-creepy way. Well, a little bit creepy but you get used to it. Apple Watch prices start from $349 for the 38mm Apple Watch Sport and it's an extra $50 for the 42mm model. The regular Apple Watch costs from $549 for 38mm and $599 for the 42mm. The second-gen Moto 360 is available to pre-order now starting from $299.99. These two beasts of the smartwatch battle are likely to polarise opinion – and not in the way you'd expect. The Apple Watch actually represents the techier end of the smartwatch world with its square screen and tonnes of apps. The Moto 360 looks more like a dress watch than we ever thought a smartwatch could and boasts the power of Google's operating system. And now that Android Wear works on iOS, the choice is really in your hands.